Designed with a graceful and classical poise, this iconic piece from the Vera Wang LOVE collection features a cluster ring designed into an elaborate pear shape. When viewed from the top the ring dazzles with split shoulders that have been carefully inlaid with diamonds for a luxurious look when worn. As an authentic Vera Wang piece, the inside of the shank includes the Vera Wang LOVE inscription and her signature blue sapphire that sits underneath the setting. The total weight of all the diamonds combined is 0.70ct. 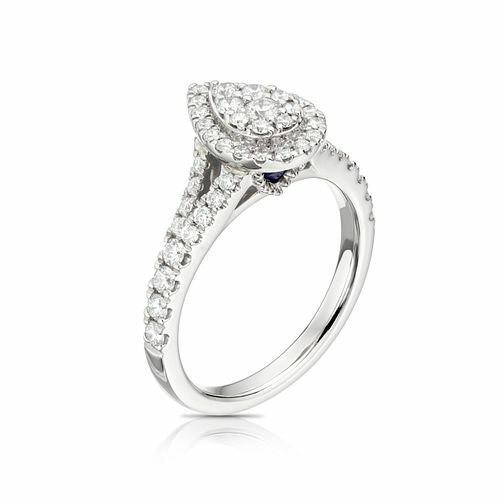 Vera Wang 18ct White Gold 0.70ct Diamond Pear Cluster Ring is rated 5.0 out of 5 by 1. Rated 5 out of 5 by Anonymous from I love it! My boyfriend now fiancé proposed to me with this ring, it is the most beautiful ring I’ve ever set my eyes on! The ring shines so bright and catches all the lights. Beautiful and such quality.